Bandicam Company, the company which makes Bandicam, has released Bandicam 2.0 -- its next generation recording software designed to meet modern IT needs. The new version of the multi-talented screen recorder not only provides an easy-to-use interface but also fully supports the hardware accelerated h.264 encoder of Nvidia CUDA/NVENC, Intel Quick Sync video and AMD VCE which allow video to be recorded in high speed, with a high compression ratio and excellent quality. People who want to create 4K videos have to buy expensive hardware such as a professional camera, Smartphone, tablet or capture card. 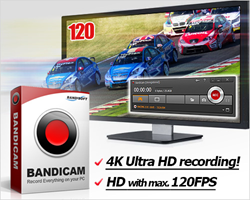 However, those who use Bandicam can easily make 4K UHD videos at resolutions of up to 3840 x 2160 in size and capture HD videos at up to 120 FPS without purchasing pricey equipment. Since the release of Bandicam 2.0, Bandicam.com has seen a sharp increase in web traffic. According to the popular website ranking site Alexa.com, Bandicam.com has climbed the rankings to surpass its rivals, proving that Bandicam is improving with each release. One of the standout features which has made Bandicam so popular is its well thought-out settings which give users a lot of control, yet are simple to use. Bandicam can record both desktop screens and DirectX/OpenGL gameplay with multiple audio streams such as the PC audio and microphone at the same time. Users can also select YouTube presets which allow them to change the resolution and optimize the recorded video for YouTube. Furthermore, Bandicam, when in desktop recording mode, supports the real-time highlighting of the mouse cursor and mouse click effects, a feature which competing software lacks. When these mouse effects are used in conjunction with simple microphone recording, Bandicam is the ideal screen recorder for making tutorials.